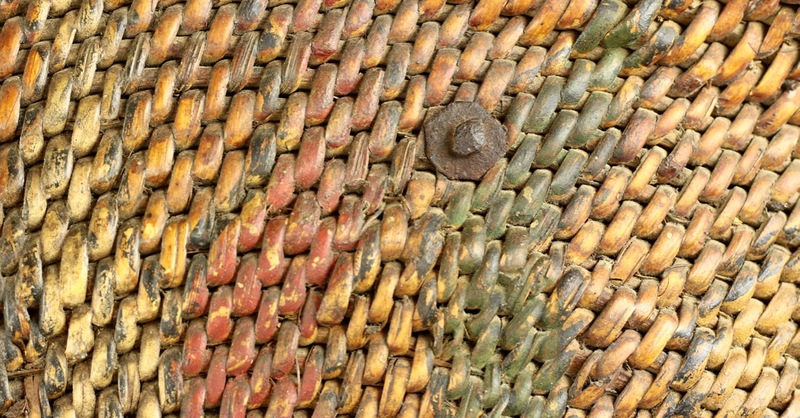 Materials: Rattan, wood, iron, pigments. 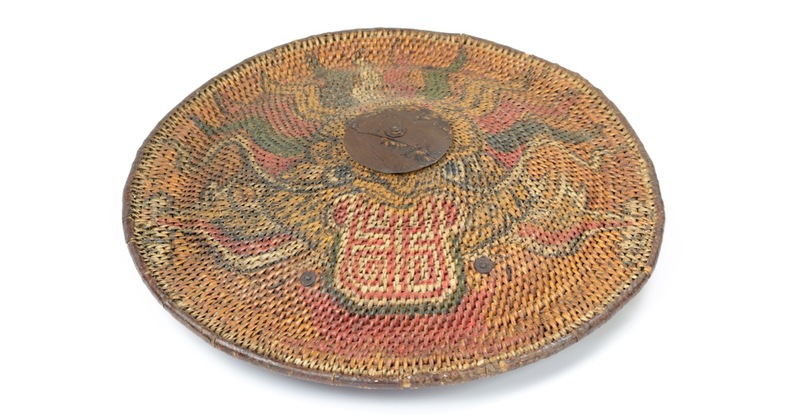 A very rare example of a Vietnamese rattan shield. 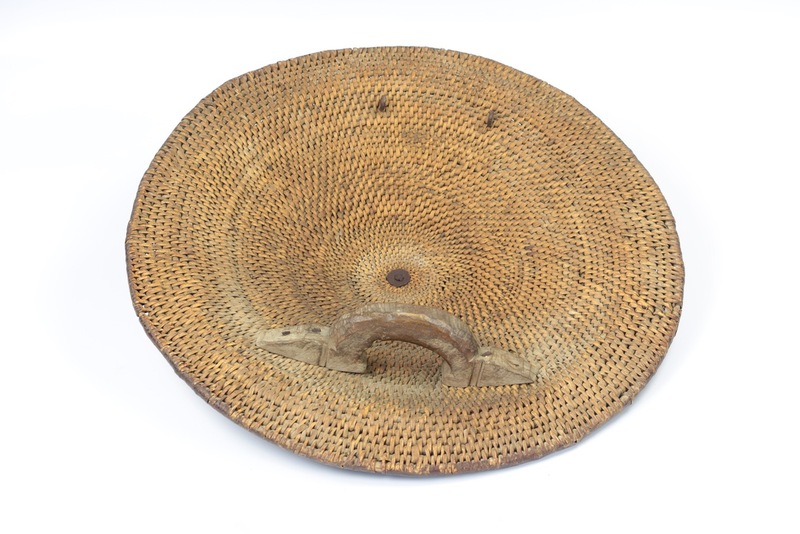 It's made with a coiling core that is held together with a wrap of rattan skin, with a rim reinforced with what appears to be thick lacquered bark. 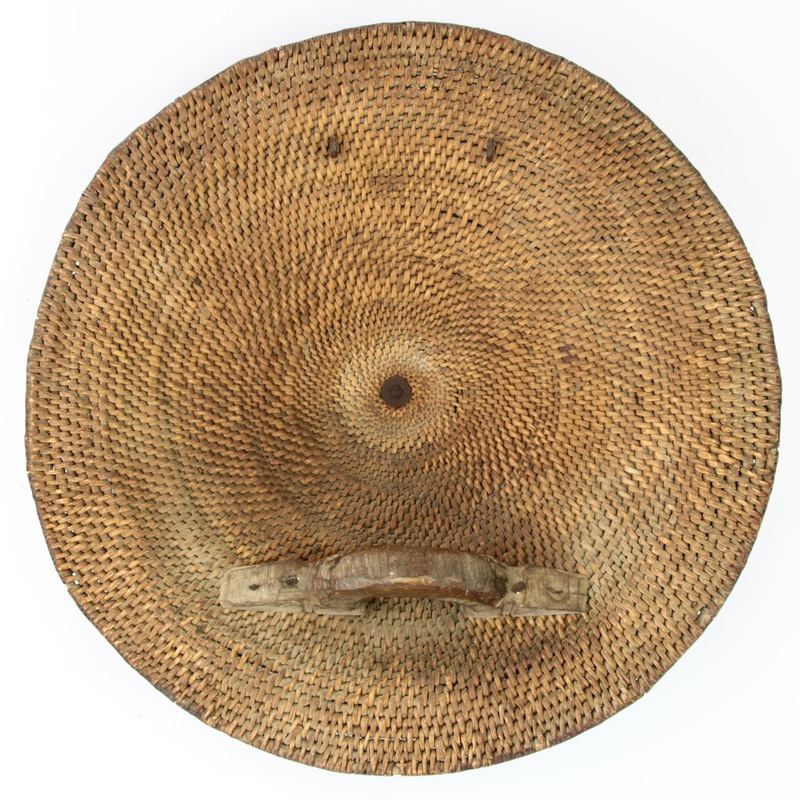 It has a carved wooden handle for the hand and two loops for a cord for the forearm. 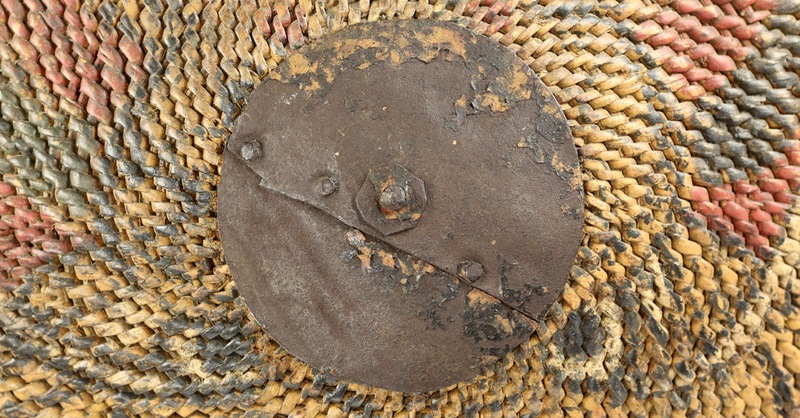 Both are connected to the shield with iron pins, peened over a washer on the outside of the shield. 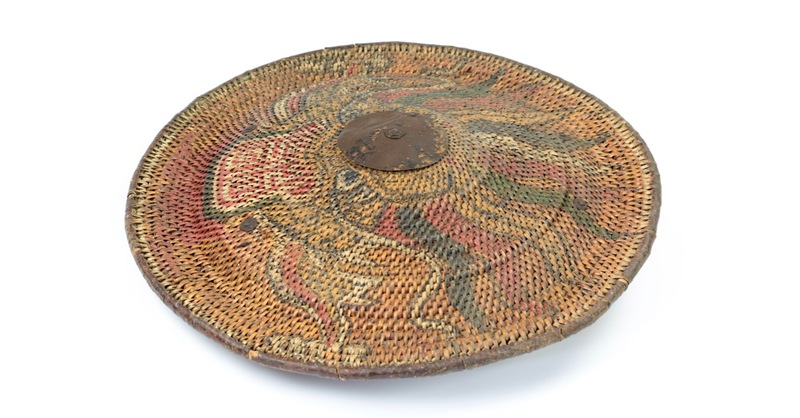 At the center is an iron boss, also held to the shield with an iron pin, peened over a washer on both sides. 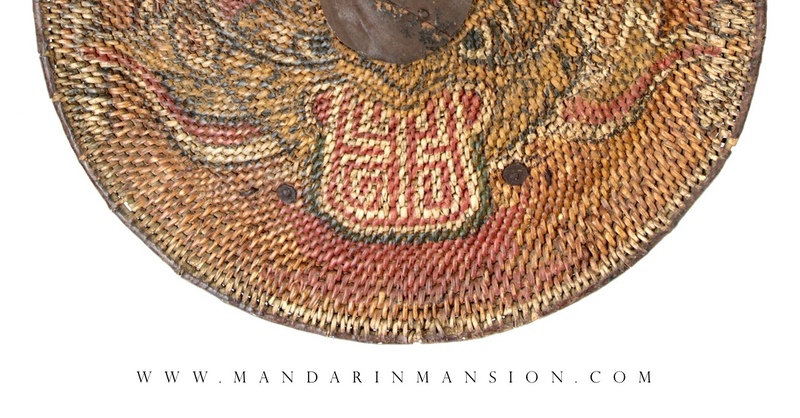 The main identifying Vietnamese element on this shield is the painting of its face, which is a highly stylized dragon with colorful manes that is in the process of eating a tablet with the stylized character on it, 壽 (Pronounced shou in Mandarin) for longevity. 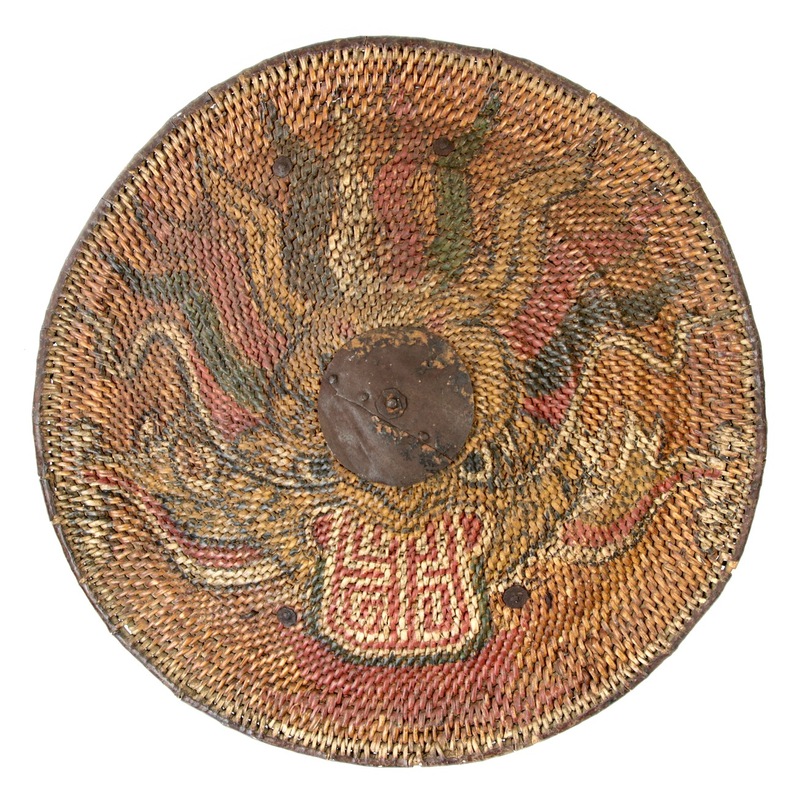 The shield is very similar to Chinese rattan shields, but there are subtle differences that firmly put this shield in the Vietnamese culture: The core that makes up the main coil on the shield tends to be of rather even thickness on Chinese examples, but on the Vietnamese example it goes from thin in the middle to thicker on the outside. The wrapping is somewhat tighter than on Chinese shields. 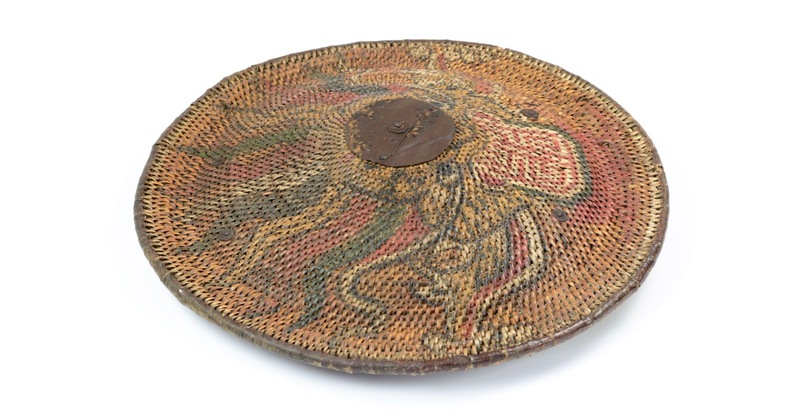 Chinese shields invariably have a handle system consisting of a straight handle bar and two loops of thin rattan core, all parts woven into the shield. 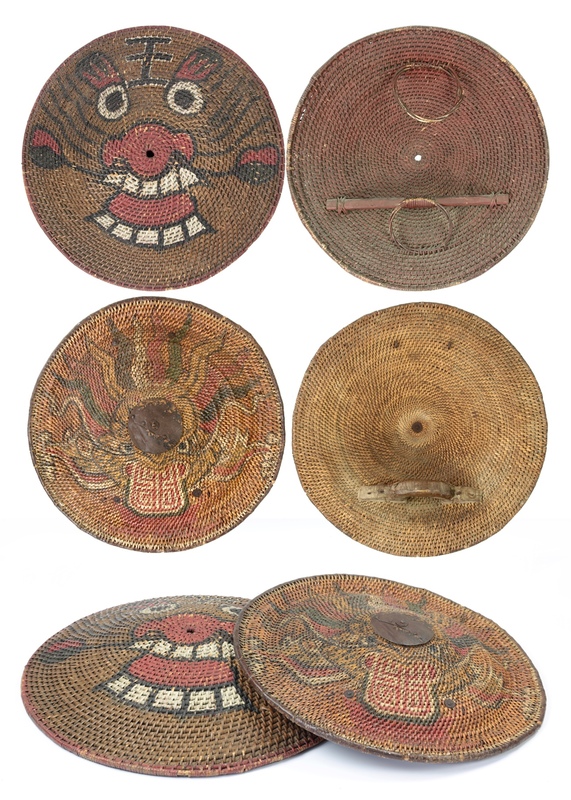 Some, but not all Chinese shields have a brass or iron spike or boss in the center. 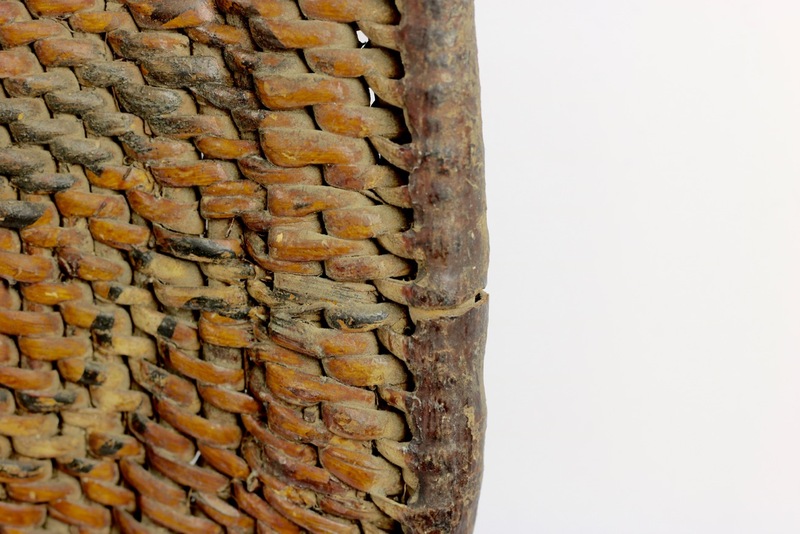 Comparison between a Chinese rattan shield in my collection, and this Vietnamese rattan shield. 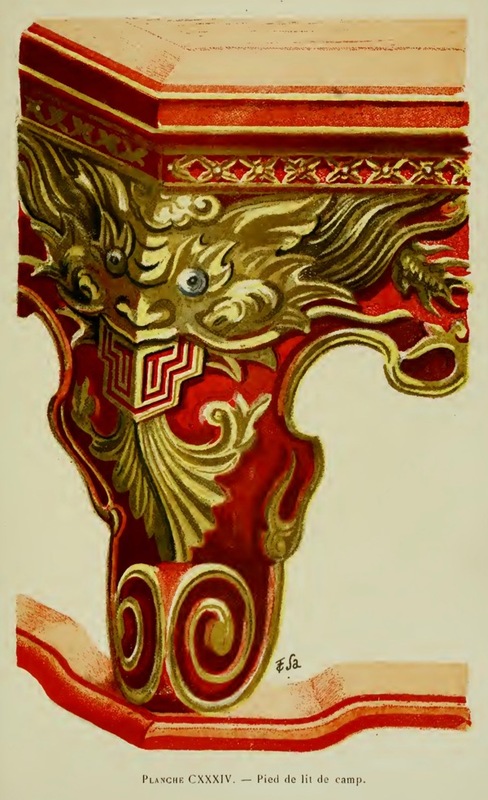 Chinese shields would be either plain or have a stylized tiger painted on the outer face, often with the character "王" ( wang ) meaning "king" on its forehead. Tiger is pronounced hu in Chinese which is a pun for "to protect", and it serves as a protective deity in Chinese folk religion. Possibly because of the absence of this pun in Vietnamese, the tiger didn't enjoy the same protective connotation in Vietnamese. 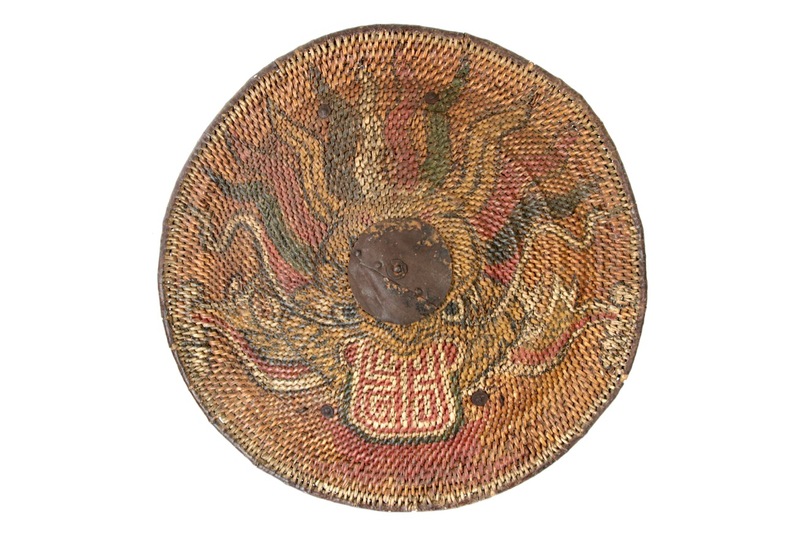 The Vietnamese consider themselves people of the dragon, which may have lead them to a depiction of a dragon on their shields instead. Some Vietnamese dragons. Left: On the foot of a camp-bed. Right: Described as "dragon in it's nest". Notice it combines features from several Chinese animals, such as the 王 commonly found on the tiger's forehead. 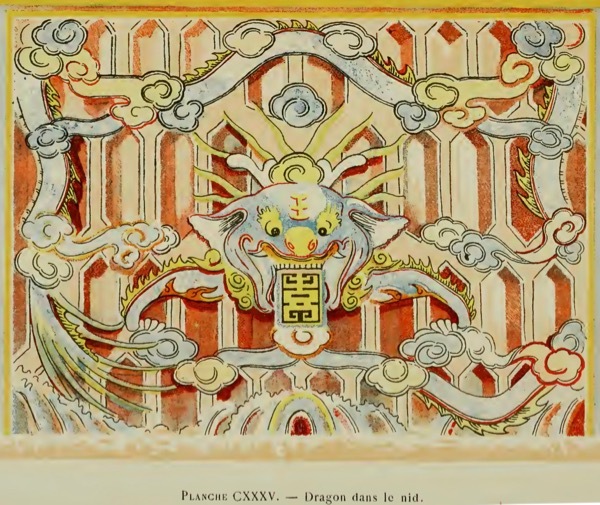 From: L'art a Hué Nouvelle edition by ras, Edmund, & L. Cadière. Published by Imprimeriere d'Extreme Orient, Hanoi-Haiphong, 1923. 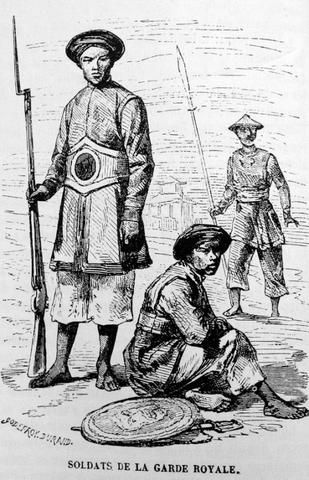 Some Vietnamese soldiers of the Nguyen dynasty royal guard, showing a rattan shield on the ground. 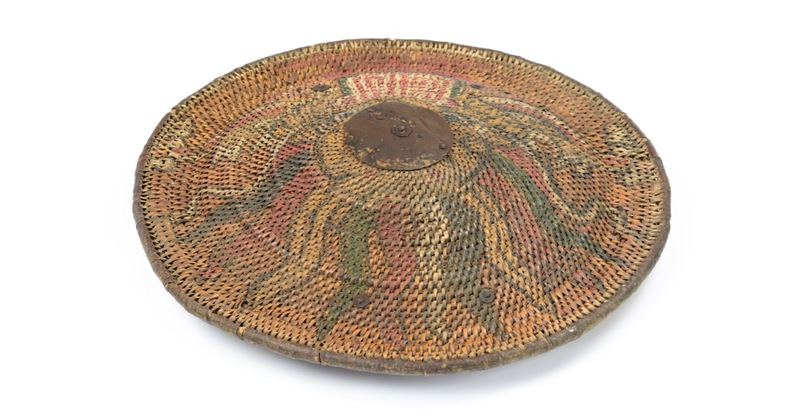 A very rare and charming example of a Vietnamese woven rattan shield, in great condition.